Kate Middleton prepared herself for about nine months to fall in love again for a lifetime. She became a mother for the third time along with her husband Prince William. 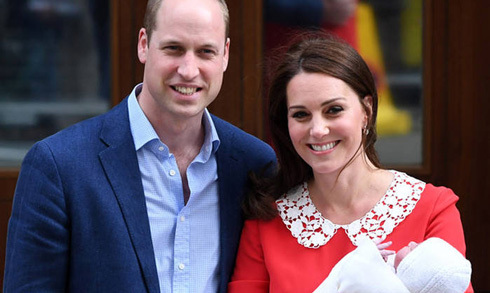 Duchess of Cambridge Kate gave birth to her baby on April 23, 2018. Kate seems to be like her mother Carole as she has a core of steel and a burning ambition that might surprise all of us. Do you all want to know in details about the baby and the news in details? Keep Scrolling! Kate Middleton who was married to Prince William gave birth to their 3rd child in 2018. William took Kate to St. Mary’s Hospital in a car after she suffered from early labor pain. As per the Kensington Palace report, the new arrival baby weighs 8 lbs 70z. Both the couple along with all their family members were happy with the news. After seven hours of giving birth to a baby boy, Kate and Prince came out from the Hospital. The baby boy was wrapped in a white shawl. The baby was born on the occasion of St. George’s Day. Kate first two children named Princess Charlotte and Prince George also visited their baby brother. Kate was dressed up in a red dress which symbolizes the same dress Diana, her mother in law wore when she gave birth to Prince Harry. Previously when Kate gave birth to her first child also wore blue polka dots dress the same type of dress which Diana wore when borning Prince William. Kate Middleton and Prince William have a fairy tale romance since they meet as students. All along their journey till marriage that has got many challenges. In 2007 after being together for several years the couple was even separated when Prince moved to the UK for his job. Later on, the royal families wonder that there is something special about Kate which made even Prince William fall in love. So, in 2011 the couple was married. The couple gave birth to their first baby boy and named him Prince George. The duo seems to be happy together are there are no rumors regarding their past affairs and divorce. Hope the couple will always be same and live a blissful married life together.